A good vanilla ice cream is the base of many frozen desserts. This easy vanilla ice cream recipe doesn’t require eggs or cooking, so it comes together quickly. With normal ice cream recipes, you want to refrigerate your mixture before putting it in the ice cream freezer. However, since this is a no-cook recipe, the milk and cream should still be plenty cold. If you store the bowl of your ice cream maker in the freezer, you can have great homemade vanilla ice cream in about fifteen minutes. Whisk together the milk and granulated sugar. Gently stir in the heavy cream and vanilla. Freeze according to the directions of your ice cream maker. While vanilla ice cream is great, it's even better when made with a real vanilla bean. If you have one available, it’s easy to substitute it for the vanilla extract in this recipe. Using a paring knife, split a vanilla bean in half lengthwise. Scrape out the seeds and add them and the pod to the cream, milk, and sugar. Refrigerate the mixture for at least thirty minutes (overnight is better). Remove the pod and freeze your ice cream as normal. 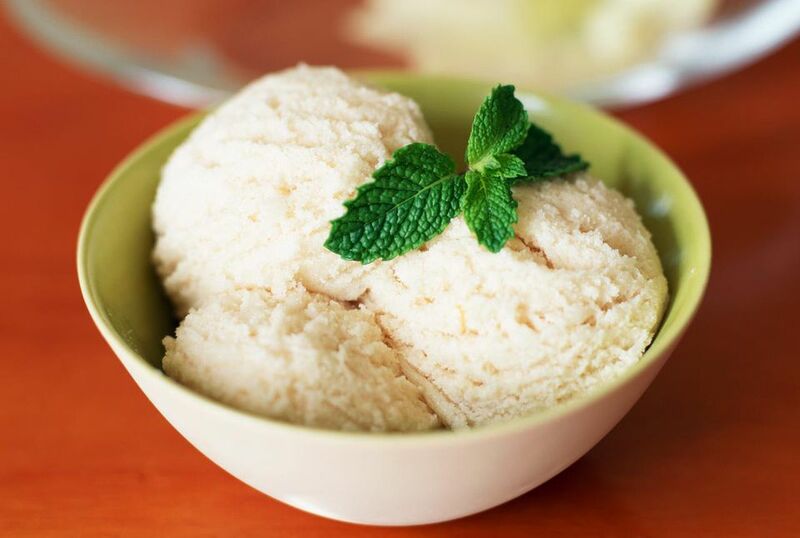 You can use whatever kind of milk you have on hand but whole milk will best help retain the texture of your ice cream while it is stored in the freezer. For example, after two days in the freezer, an ice cream made with 1 percent milk can become a little too icy. While it still tastes great, the texture might be a bit of a disappointment. Don’t whip the mixture too much once you add the heavy cream. You don’t want to beat too much air into the mixture before it goes into the ice cream maker, or it will change the texture of the finished product. The ice cream maker will beat in plenty of air, so you shouldn't add to that. This recipe can be made without using an ice cream maker. It will take more time and effort, but it will still taste great. Follow these step-by-step directions that show you how to freeze your ice cream without buying another small appliance. You can turn this vanilla ice cream into any flavor you can imagine. Add cocoa powder to make chocolate ice cream or add your favorite ice cream treats. Crumble sandwich cookies into the finished product, toss in chocolate chips, or swirl the ice cream with a ribbon of caramel. The possibilities are endless, so get creative!